Toms River will resurface all of its tennis courts in its network of township parks — both on the barrier island and mainland. The township is seeking bids for the project, which focuses on the 26 tennis courts around town, as well as resurfacing six basketball courts. On July 11, township officials offered to tour its facilities with interested bidders so they could explain the scope of the work. The tour began at Bayside Park in Ortley Beach and went on to the other facilities. Township Administrator Don Guardian told Shorebeat that the project was approved late 2017. The bid period ended July 27, with the township council expected to award a bid at a coming meeting. Guardian said the new surfaces should last 20 years. 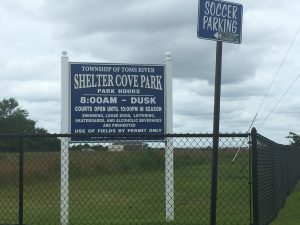 Township parks that have tennis courts include Shelter Cove, Bayside Park in Ortley, Bey Lea Park and Chadwick Beach Park. The capital campaign approved in late 2017 includes the resurfacing of the tennis courts and lighting improvements at complexes such as Riverwood Park’s soccer fields, as well as the permit costs for building a boat ramp in Gilford Park off Dillon’s Creek. The next township council meeting is August 14.